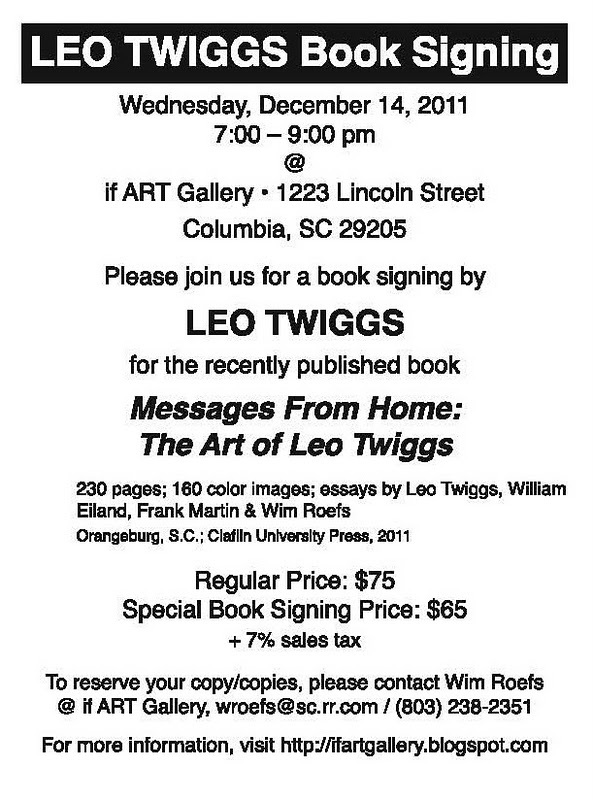 At its location at 1223 Lincoln Street, Columbia, SC, if ART Gallery presents and book signing with batik artist Leo Twiggs for Messages From Home: The Art of Leo Twiggs, which was published recently by Claflin University Press in Orangeburg, S.C. The signing will take place on Wednesday, December 14, 7:00 – 9:00 p.m. The book will be for sale during the book signing for a discounted price of $65; the regular price is $75. The 230-page book contains 160 color plates of Twiggs' work of the past 45 years and essays by Twiggs, Georgia Museum of Art director William Eiland, South Carolina State University art historian Frank Martin and if ART Gallery owner Wim Roefs. In nine short essays, Orangeburg resident Twiggs discusses several series of his work and the personal experiences that were the impetus for the series. Eiland wrote the book’s foreword while Martin contributed an analysis of Twiggs’s work titled “The Art of Leo Twiggs as a Metaphor of Lived Experience.” Roefs essay, “Leo Twiggs: Batik Artist,” provides an overview of Twiggs’ career and working methods as well as a discussion of his work. 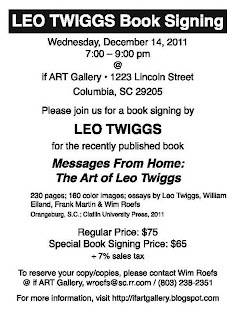 Twiggs is one of the most prominent artists, art educators and art administrators in South Carolina of the past four decades. He is widely regarded as the foremost pioneer in the United States in developing batik as a modern art form. Twiggs was born in 1934 in St. Stephen, S.C. He received his BA from Claflin University, studying with Arthur Rose. He studied at the Art Institute of Chicago and earned his MA from New York University, where he studied with the legendary African-American artist Hale Woodruff. Twiggs was the first African American to receive the doctorate in art education from the University of Georgia and the first visual artist to receive Elizabeth O’Neill Verner Award, South Carolina’s Governor’s Award for the Arts. Twiggs’ paintings are done in a unique batik process that he developed through an innovative manipulation of the traditional technique. He has won international recognition and numerous awards. Several works have been selected for U.S. Embassies in Rome, Sierra Leone and Senegal, among other places. He has had some 70 solo exhibitions and has exhibited at the Studio Museum in New York and in shows at the American Crafts Museum, the Mint Museum in Charlotte and the Herbert F. Johnson Museum at Cornell University in Ithaca, NY. Twiggs work is in museum collections throughout the United States. In 2001, Twiggs was selected to design an ornament for the White House Christmas tree. In 2004, the Georgia Museum of Art organized a major retrospective of his work, which toured the southeast, including a stop at the S.C. State Museum in Columbia. A Claflin Homecoming, The Art of Leo Twiggs was organized by the Rose Museum at Claflin University in 2007. Twiggs’ most recent solo exhibition, his largest to date, is Civil/Uncivil: The Art of Leo Twiggs at Charleston’s City Gallery at Waterfront Park. The April – May 2011 exhibition, curated by if ART’s Roefs, addressed the legacy of the Civil War and Civil Rights in the U.S. South. The exhibition was organized by the City of Charleston in commemoration of the 150th anniversary of the beginning of the Civil War. Twiggs is Professor Emeritus at S.C. State University, where he was chair of the art department and director of the Stanback Museum. He is Distinguished Artist-in Residence at Claflin University.